RSVP’s flagship journal, Victorian Periodicals Review, publishes the latest research in the vibrant and rapidly expanding field of 19th-century media studies. VPR features special issues, book reviews, announcements, and a biennial bibliography. Subscribe to VPR today! Subscription to VPR automatically enrolls you as a member of RSVP, one of the most distinguished, dynamic, and collegial scholarly organizations in the world today. RSVP has kept the cost of individual subscriptions low in order to make the riches of this splendid journal available to as many readers as possible. To subscribe or manage your subscription, click on the links in the sidebar. 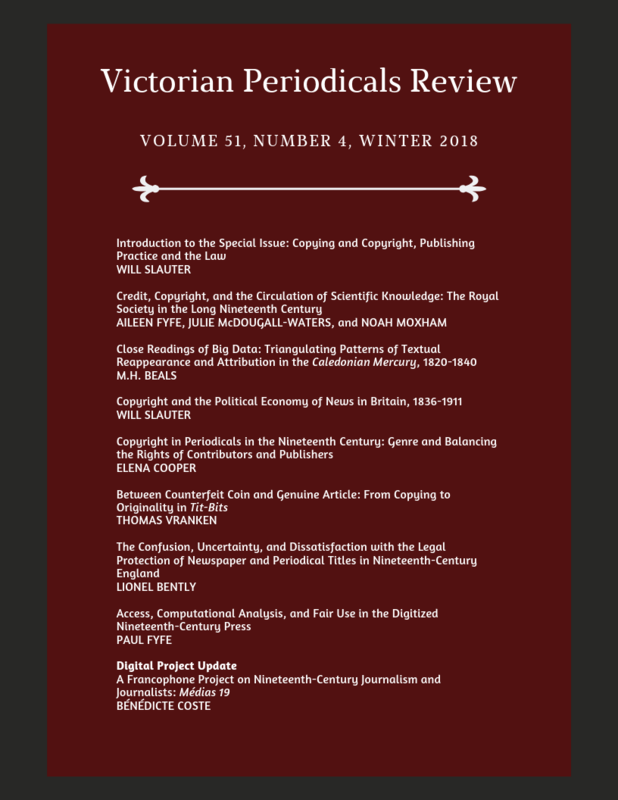 We are excited to announce a second edition of the Nineteenth-Century Serials Edition (ncse). Funded by King’s College London, and Birkbeck, University of London, it has been upgraded by King’s Digital Lab to survive the challenges of its second decade. It remains an edition of six key titles from across the period – the Monthly Repository, Northern Star, Leader, English Woman’s Journal, Tomahawk, and Publishers’ Circular – but the Facsimiles portion has been completely redesigned and augmented (see https://ncse.ac.uk/periodicals/). As well as new navigation and display, this part of the resource now has visual realisations of statistics for each title, a new bibliography covering the last decade, two new reflective essays (one on the new edition and the other on the development of the field), and the first of a series of pedagogical pieces (on how ncse’s Tomahawk illustrations by Matt Morgan, might be used in the classroom). The Research Society for Victorian Periodicals is pleased to announce the call for papers for our next annual conference. The conference, entitled ‘Work/Leisure, Duty/Pleasure’, will be hosted by the University of Brighton, UK, and will take place 25-27 July 2019. Proposals are invited for 20 minute papers or panels of three or four related papers that address any aspect of the Victorian periodical or newspaper press. Proposals relevant to the Conference theme of Work/Leisure, Duty/Pleasure would be particularly welcome. For more information about the conference theme and how to submit a proposal please visit our conference page. All those giving a paper at the RSVP conference are required to be members of the Society. Curran Fellowships competition begins! Deadline December 1, 2018. The ongoing effort to identify the writers of articles, stories, and poems in the Victorian press that is the Curran Index is getting a new look, and new super-powers! With the support of RSVP, our intrepid editor, Gary Simons, is working with a team to convert the old set of pages, which are made up of blocks of text that have had to be scrolled through, into a fully functional online database that can be searched in a variety of ways. Please visit this new and improved work in progress here (http://curranindex.org/) and read about all the latest additions to this rapidly expanding resource. To subscribe to VPR or to renew your subscription click here. To access VPR online (2005-2011, subscribers only) or to see a free sample issue, visit Project Muse here. To see older issues of VPR (1979-2005, subscribers only), visit JSTOR here. The editor of VPR invites articles on the editorial and publishing history of Victorian periodicals. Emphasis is on the historical, critical, or bibliographical importance of periodicals in the history and culture of Victorian Britain, Ireland, and the Empire. Contributions should be written in MS Word and prepared according to the Chicago Manual of Style. A VPR Style Guide is available from the editor. The author’s name should be removed from the manuscript before submission via e-mail: vpr @ rs4vp.org. (reviews @ rs4vp.org). Those interested in reviewing books should fill out this brief online form.